It's customary for me to treat myself after I have endured a stressful time. Sometimes my treats are small, like maybe a chocolate cupcake or two. Sometimes they are big. I met a deadline at work last week and well, I needed something a little bigger than a chocolate cupcake. So first I bought my watch, then I headed to Zara.com. I just adore the clean lines and the classic look. It might be too big to carry on a daily basis, but I think it would make a great work or travel bag. These are so cute- on her. Jeans that look good on one girl can look like a disaster on me, so I wouldn't dare buy these online. I could write an entire post (and probably will) regarding my thoughts on shopping for jeans. In short, I hate it. But I will have to pull myself together and try these on at the store. Have you bought anything from Zara.com?? Love the bag! I'm with you on the dress...very pretty, but if it is itchy...it would go back in a heartbeat. And, don't even get me started on jeans!! its a blessing and a curse... i just want everything! Their dresses are so amazing. very nice!!! love the dress too! Loveeee your picks...I haven't gone online yet but I am pretty sure the booties you liked this morning on my blog would go fab with all these picks. Just sayin'....cheers! Funny, I bought the same bag in brown and just returned it. Not because I didn't love it, but because it was enormous and I already have two other bags that same size. It was beautiful though. Ohhhh I must have this bag!!! I am the same way - love to treat myself to something special after a stressful time. I LOVE that bag. When you get it, you will have to let me know if you think it is too big for everyday use. And those jeans are adoooorable - love the little pockets in the front. Ok now the real question...tan or black?! loving the items you picked... i'm a big fan of zara but have never ordered online. i'm definitely curious about those jeans too but have the same jean-ordering fear!! its just the worst to shop for them isn't it?! Update!! I got the bag today and I love it! It is HUGE though!! So if you buy it, beware of the size! The dress also worked out beautifully. It doesn't have much of a shape, so it has to be belted. It is super soft and not itchy!!! love the zara bag myself! I am going to Argentina in a week and definitely stopping at zara. Oh my gosh want that bag!!! Such a great pic!! 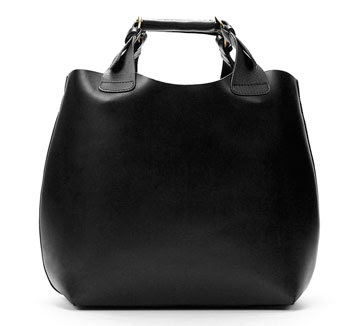 Completely obsessed with that bag ever since I saw it on Olivia! I love all of your Zara purchases. I got the cutest winter pea coat from there recently. Love. Um that bag! I am now obsessing! So you bought the black? It's GORGEOUS but I do love the brown as well. I can't wait to read more of your blog. So cute. New follower.